Because I am nothing if not timely, ahem, about 6 weeks ago my friend Michelle made these incredible little pieces of JOY, Strawberry Short(Cup)Cakes, for a picnic a bunch of us girls were going to. Little angel food cupcakes filled with a chunky, homemade strawberry sauce topped with a cream cheese whipped cream icing. I would love to say we were all adults and shared with the kids, but I don’t know that I can with a straight face. They got a few…I think. Seriously they were top 3 ever as far as perfectly portable picnic desserts go. Better than brownies, even. I know. That good. But the boxed cake mix…definitely not a first choice. For me, or Michelle. 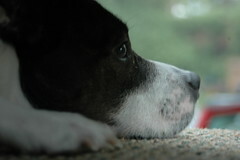 She prefers to actually cook, but didn’t have a good go-to angel food cake recipe, the box mix is a sure thing. I can’t argue with that logic, especially when its for food not being eaten by the immediate family – they don’t care if it’s ugly as long as it tastes good. I was commissioned to dig up & dust off my angel food cake recipe. I know, torture, right? 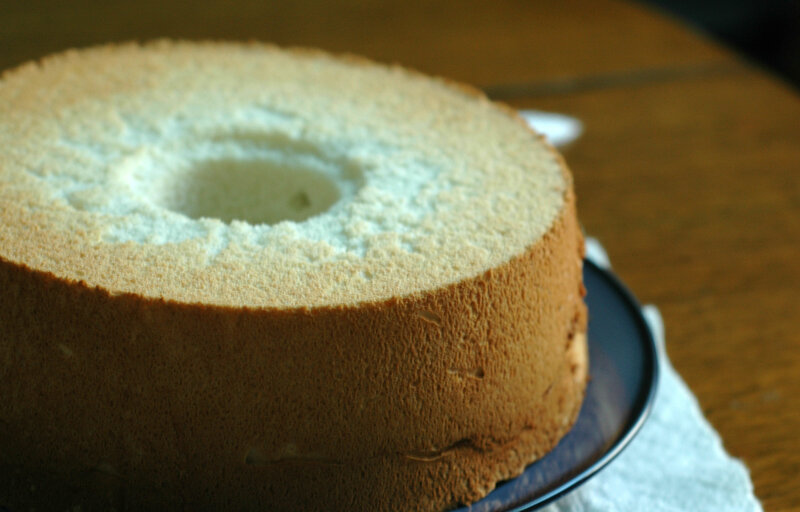 Angel food cake is a light, sweet, airy sponge cake, usually baked in an un-greased tube pan. By itself, even with a glaze, it’s rather unimpressive, though quite tasty and all sorts of useful as a summer dessert component; it soaks up fruit juices, whipped or iced creams, syrups or sauces like a sponge (hence the term sponge cake) while maintaining its structure. Angel food cake, unlike most other cakes, has no fat added to it and is depends on stiffly whipped egg whites for its height & texture with a minimal amount of dry ingredients added to it for structure & stability. The process of making an angel food cake SOUNDS much more complicated than it actually is. 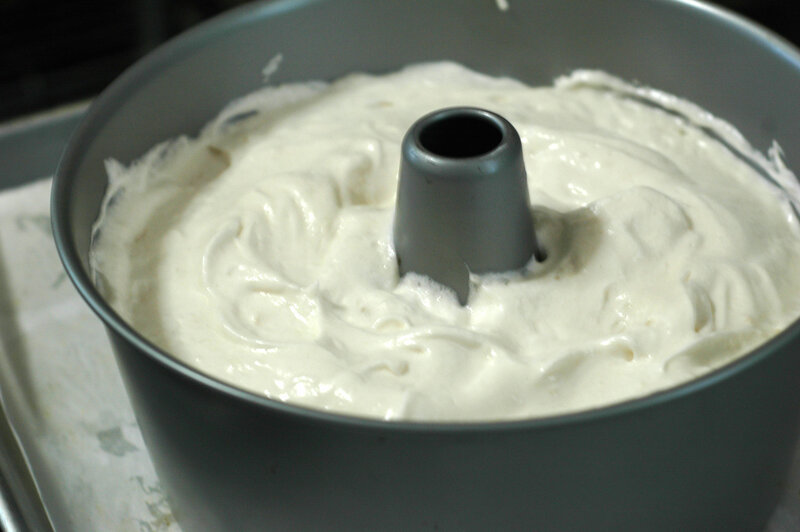 From separating the eggs to getting the cake in the oven = less than 15 minutes, closer to 10 if you use a stand mixer. As easy as it is to put together it is also quite easy to mess it up; there aren’t many errors to make, but unfortunately they are all egregious ones BUT they are really easy to avoid. We shall discuss. Pick & prep your pan. I usually stick with the tube pan; mine has a removable stem that comes out making it easy to remove the cake & clean the pan. 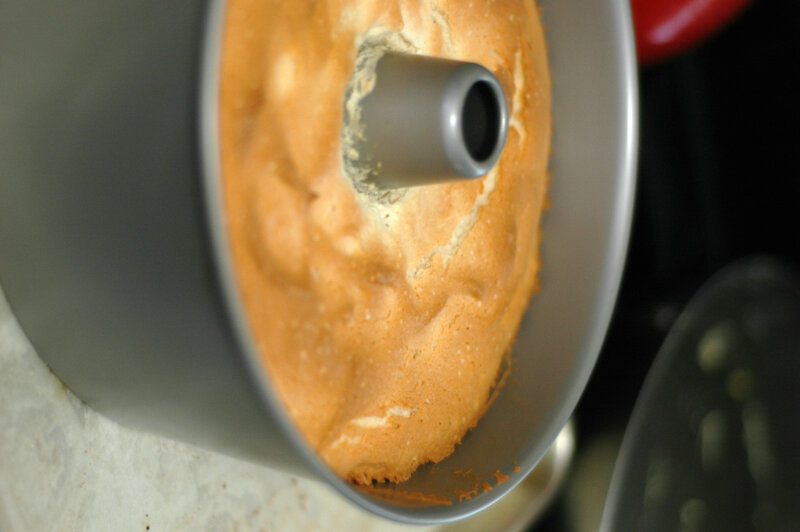 I like the classic tube pan because they are designed to allow the cake to cool upside down, which is recommended – more on that later; the stem on mine is taller than the sides of the pan, some have legs attached to the lip, that lets it stand upside down which is terribly convenient. Cupcakes will work, more on that in a bit. I have baked in 9×13 pan for a special cake thing I made. It worked, but the texture of the cake was weird, drier. To prep it make sure it is dry. Thats it. 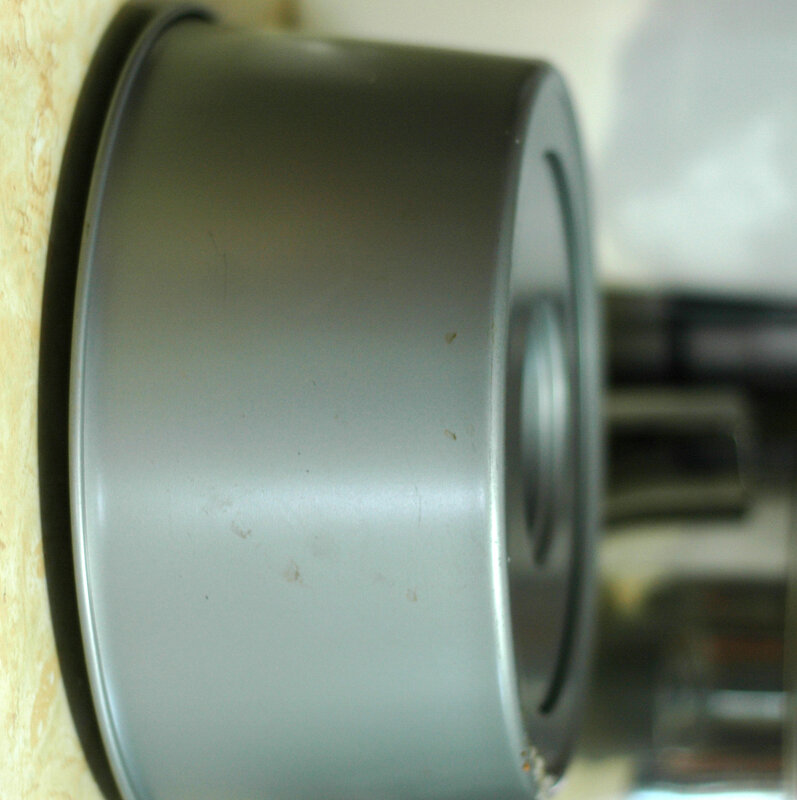 If you are using cupcake pans – line them to save your own sanity trying to get them out. You not want to grease whatever kind of pan you use, the batter needs to be able to stick to the sides to stay risen and not collapse while baking and cooling. Keeping fat away from the egg whites is the most important part of the whole cake. Not even kidding, fat makes egg whites incapable of whipping to any peak. Make sure any utensils or bowls that you are using are clean, no grease or oil on or in them. I prefer to use stainless bowls, but not necessary. The recipe calls for 12 egg whites and there cannot be a speck of yolk in them. Not. 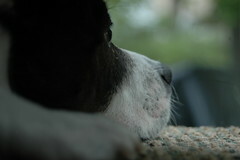 A. Speck. Egg wites will not whip, no matter how hard or what equipment you are using to whip them, if there is any yolk in the whites. If you are not an experienced egg separator use a small bowl and separate one at a time into it then dump into the bowl you are whipping them in. Doing it that way means if there is a mishap you dont have to pitch the whole batch because of it. Related: It is not possible to completely remove egg yolk from the white once some falls in there. Trust me. Every green chef tries to whip the holy hell out of egg whites they goofed up when separating and every green chef wastes a ton of time and energy to learn that when they said it won’t work they weren’t lying. The flour makes a difference, but both cake & all purpose work. When I dug out this recipe from the back of one of my notebooks I found it called for cake flour. I didn’t have any cake flour but wanted to make the cake anyway. I knew it was going to make a difference, I was right. So I made the recipe twice. Both were good, but one was better. The cake flour version was much more delicate and was, in texture & density, much closer to, better even, than the boxed mix. In general I would recommend using the cake flour, the cake texture is lighter and more absorbant when it comes to use in desserts and the benefit is worth having the extra flour on hand to make it. This recipe is one of those ones that since the flour is specified there’s probably a reason for it. That said, the all purpose flour version was totally good! 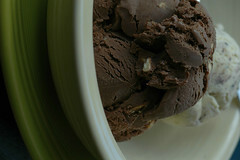 It was firmer and more dense when compared to the box mix or the store bought, but it was still delicious. I preferred the texture of the cake flour one, but there were some definite benefits to the AP version. The structure was better so it was far easier to cut, at a glance the air bubbles were finer leading to the slightly increased density. If I were making cupcakes I would use the all purpose flour; the final cake had more structure that would make removing a wrapper much easier. It also did not collapse at all, which since you can’t flip them upside down to cool is a good thing. That added firmness will also make them much easier to hollow out if you were planning to, say, fill them with a homemade strawberry sauce, maybe. As far as equipment I used my hand blender with whisk to make the first one and my KitchenAid with the whisk for the second. Both worked just fine, but the stand mixer was infinitely faster, no big surprise. I wouldn’t recommend making this by hand unless you have intense upper body strength & stamina. Outside of the tube pan I used a stainless steel bowl, a regular rubber spatula to fold in the dry ingredients and a hand strainer to sift the dry ingredients together. The cream of tartar in this recipe isn’t used as a leavener, it is used to stabilize the egg whites as they whip and help them hold air. I add the salt in with the cream of tartar so it can dissolve, it also helps them whip faster & higher. The dry ingredients are sifted twice, once to combine them and again as they are sifted into the whipped egg whites to make the cake batter. I save my yolks…for ice cream. You can freeze them in a container & thaw to use later. So let’s bake a cake! Preheat the oven to 375, get your pan(s) out & ready. Sift together the 1/2 cup sugar & flour on to a piece or parchment or wax paper. Separate the eggs, do what you will with the yolks, put the whites into the mixer bowl. Whip on a relatively high speed until foamy and the whites are loosened up. Add the pinch of salt and the cream of tartar. Once the cream of tartar & salt are added turn up the mixer to high and whip to a very soft peak, this will take a couple minutes. You will notice as they whip they get whiter, less foamy, more solid looking and glossier. They will double in volume while you whip. When the whites will hold a soft shape and look like the picture above slowly add the 3/4 cup of sugar in a steady stream while the mixer runs on high, making a basic meringue. Whip to a ‘soft peak’, meaning it will hold its shape when pulled into a peak. 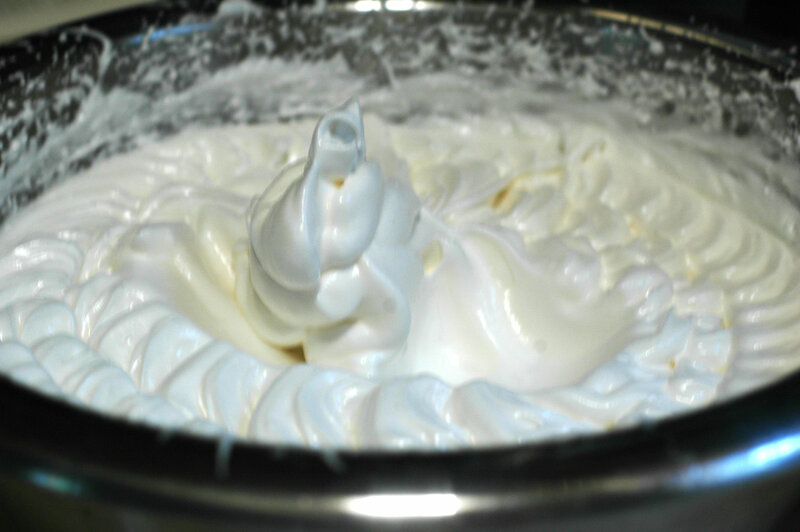 At a soft peak the meringue will close to triple in volume, start to look creamy white, be shiny and start to feel stiff. With the mixer running add the lemon juice and vanilla extract. 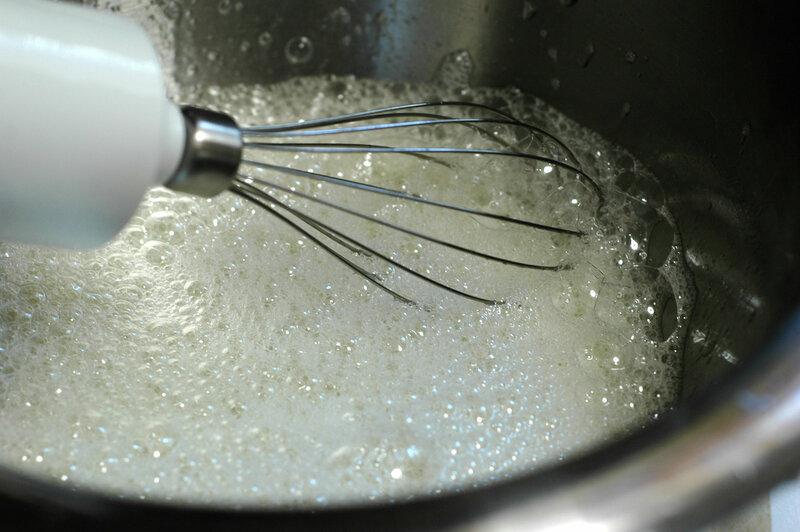 Whip the egg white mixture on high until it reaches a 2″ stiff peak, this will also take a minute. 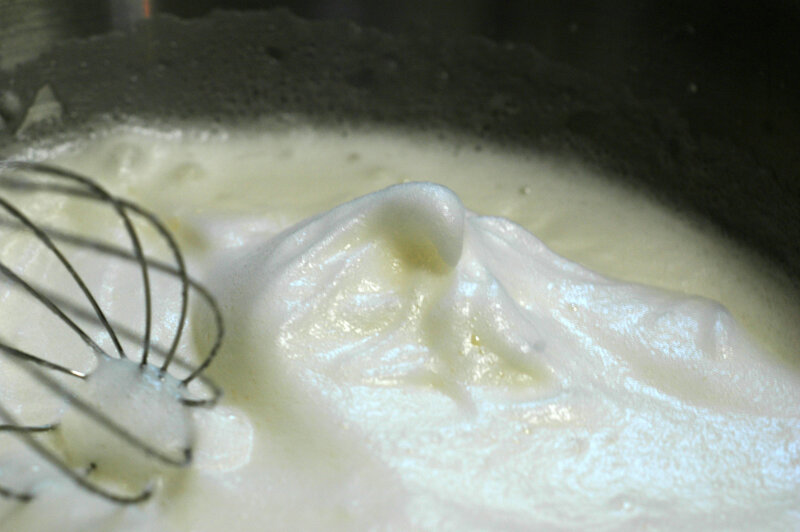 A ‘2″ stiff peak’ means that when you use the whisk to make a 2″ peak with the meringue it holds easily. 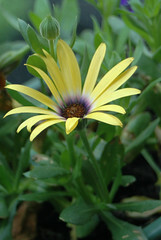 They will also be pure white, glossy, creamy and rich looking. Where can this go wrong? 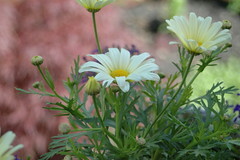 In the mixing of the whites, mainly. You want to make sure to not over mix them. 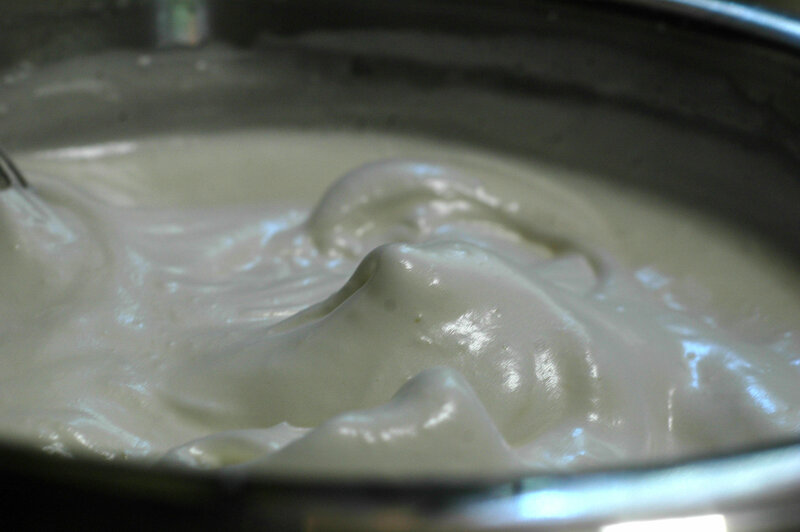 Over mixed egg whites are rocky looking, not smooth and creamy. Using a hand mixer or hand blender this is hard to do, honestly, neither one is fast enough to narrow the margin of error as significantly a stand mixer on high so keep an eye on the whites while mixing. Make sure not to over whip, the texture of the cake is eggy and weird if you do, the batter won’t come together correctly. The only other part that really effects the cake is how the dry ingredients are incorporated into the meringue. They have to be added by hand, using a rubber spatula and a gently folding motion, turning the batter over slowly in the bowl to distribute the flour. This motion involves no stirring or beating, just a gentle turning motion. The goal is to not squash all that lovely air you spent so long incorporating into the meringue, but to add the flour mixture as delicately as you can. Turn the bowl as you fold to get it mixed evenly. guessed it, 10 turns. You should have a voluminous batter, evenly and gently mixed together. Pour the batter into the pan(s) and even out the top. Get into the oven. For cupcakes I would fill the pans to just about full with a blue handled scoop. Bake for 30-40 minutes. The cake is done when the top is golden brown and springs back when you push it down. The cake may also start to pull away from the sides of the pan, too, but that is not a guarantee of doneness, the springiness of the center is. I start checking it at 30 minutes and adjust in 5 minute increments from there until it is done. For cupcakes I’d start checking at 25 minutes, they are smaller. Flip the pan over, use something to prop up the center so it is off the counter if you have to, and let it cool. When making the full cake I do think this makes a difference, even if it sounds ridiculous. The sponge cake is delicate, cooling upside down lets the structure set with no weight on it, making the cake all that much lighter. This isn’t possible with cupcakes, instead let them set up in the pans for a few minutes then remove them to cool completely. Run a knife, I use my boning knife, around the outside of the pan and the stem of the tube to loosen the cake and get it removed from the pan. Let it cool completely on a rack before plating or trying to cut. You can glaze it from here with a powdered sugar citrus or liqueur glaze, top it with fresh berries macerated in sugar, drizzle it with chocolate or vanilla sauce or make those really good Strawberry Short(Cup)Cakes Michelle made over at BurghBaby. I topped mine with vanilla bean ice cream and some Amish sliced peaches & fresh strawberries macerated in the peach syrup. Yum! Thanks for such a detailed tutorial. 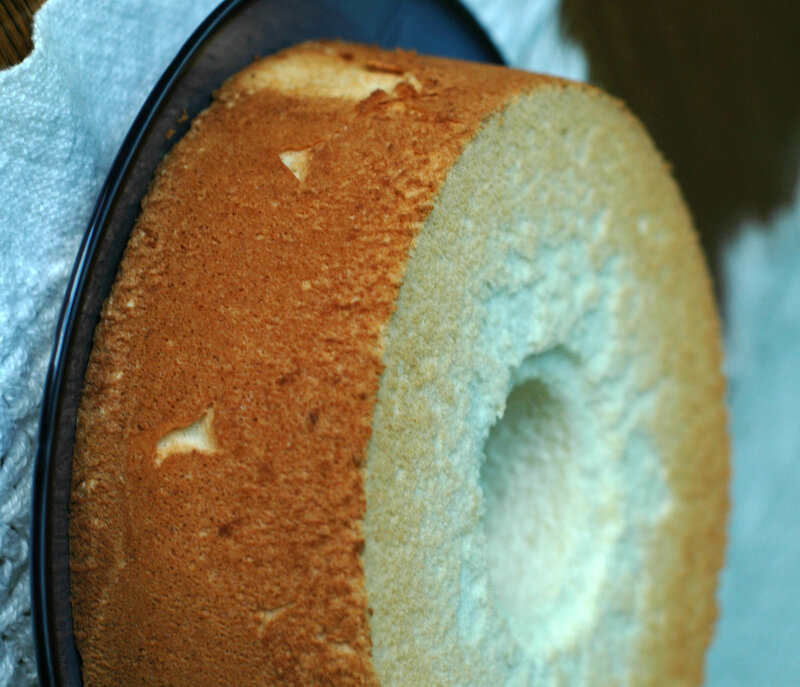 Angel food cake is by far my favorite cake but I’ve been too intimidated to make it myself. So thank you for posting! 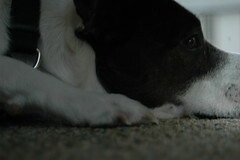 :) I love your blog. I love angel food cake. My gram used to make it for me all the time and I can eat it plain, or with fruit – either way it’s delicious. One thing I hate is when people put icing on it – yuck.